When spiders unite, they can tie down a lion. This is an adage that I often heard growing up, and one that I was reminded of when I was in Durban last year. South Durban is home to the highest concentration of petrochemical industries in South Africa, and yet is facing the potential impact of new petroleum exploration off the coast of Kwa Zulu Natal. Thousand Currents’ partner South Durban Community Environmental Alliance (SDCEA) is going up against the Italian firm ENI and South African firm Sasol to save what remains of the areas’ environment and roll back the damage caused by unfettered and unaccountable corporations creating and dumping wastes into the air, seas, and soil. All over the world, we have seen the awful images of the catastrophic harm to marine life and coastal communities caused by oil spills. Expanded offshore oil and gas exploration poses different – but no less dangerous – impact on the livelihoods of 50,000 fisherfolk working off the coasts of Kwa Zulu Natal as seismic tests either kill marine life or force marine life to move away; and oil and gas refining, which happens more in Durban than anywhere else in Africa, has devastating health impacts on South Durban communities. SDCEA goes head to head with some of these large corporations, countering their environmental impact assessments with facts from the communities and their own research. Using the democratic channels available to them, they bring the voices of the most affected to the table of decision makers, in this case demanding an independent body to oversee a consultation process which includes proper advertisement of public consultations on ENI and Sasol’s plans. They want to ensure that communities are aware of when and where the consultations are happening and to ensure that the processes, including the sharing of relevant documents and advertisement of the consultations, happen not only in English but also in Xhosa and IsiZulu. [a]t a time [when] South African leaders are seeking Foreign Direct Investment, these companies’ promises of trickle-down benefits to our shrinking foreign reserves and to the huge pool of unemployed labour are apparently mesmerizing – but they are also deceptive, because extractive industries engage in the worst of Africa’s notorious Illicit Financial Flows, and because oil rigs, refining and transport are all capital-intensive, requiring only a few skilled workers. 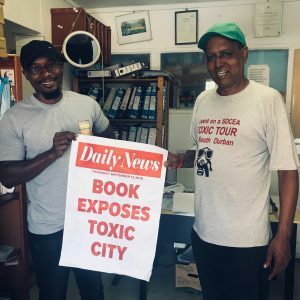 Whether it is making legal arguments in a courtroom or protests in the streets of South Durban, SDCEA is a people-powered alliance which centeres the well-being of the community and the environment rather than profit. This isn’t the first time that they’ve taken on industry in defence of their communities and it won’t be the last. As the work of Thousand Currents’ partners attests, the odds are shifting, and besides, in the stories I know, spiders always win.